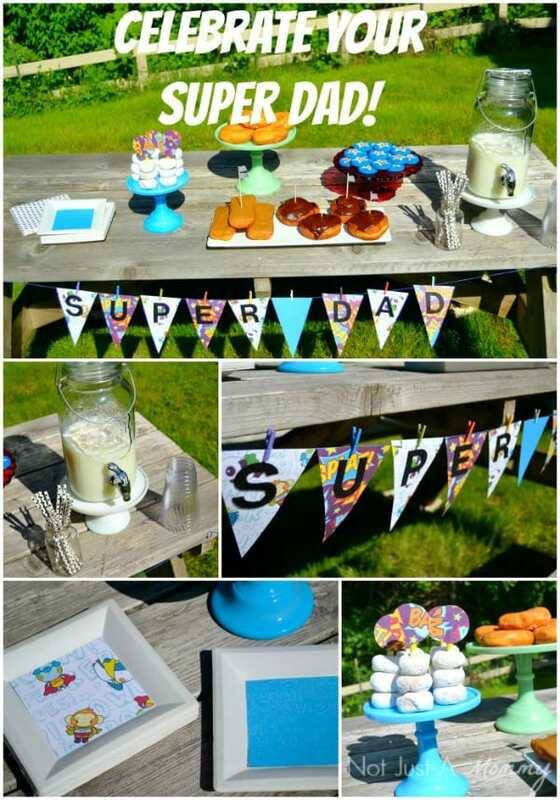 These Father’s Day party ideas are courtesy of our contributor Dawn…Father’s Day is coming up fast! To celebrate, this Friday is our annual PTSA event, Doughnuts For Dad, where dads and substitute parental figures are invited to an early morning breakfast of donuts and fruit while getting treated like royalty. Coincidentally, Friday is also National Doughnut Day so I thought what would be more perfect than to share this as a full-fledged party table. 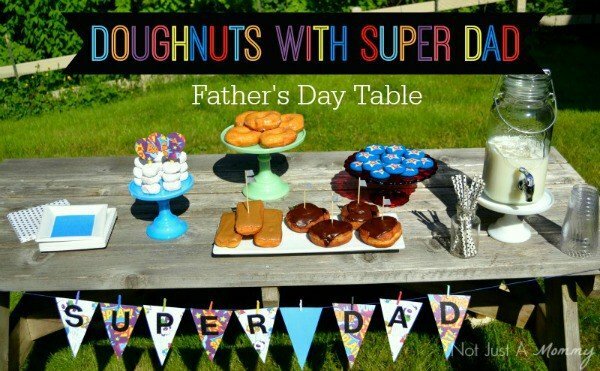 Invite a few friends and family over and make your dads feel super special with your own Doughnuts With Super Dad. This table was so easy to put together and as always, I love things that are easy but have a big effect. 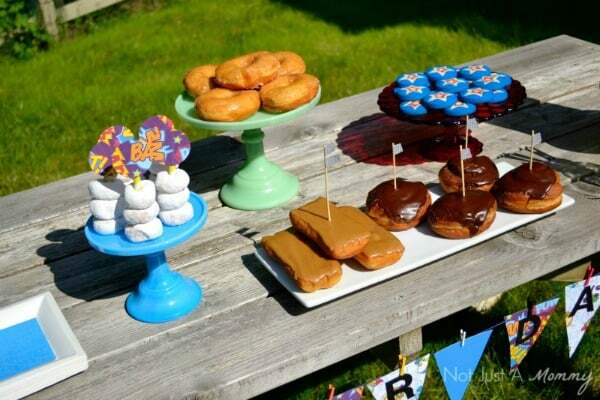 Break out all your cake stands, platters, plates and don’t be afraid to mix and match. If you don’t have a lot of vessels, you can make your own. 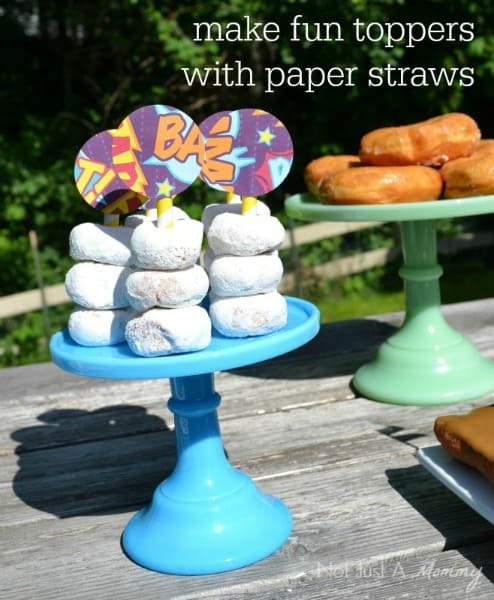 Check out my post on how to make fun stands with sturdy paper plates and cups. Varying heights is the key to a great table. Stacking your doughnuts by type and size is the perfect way to add visual interest. 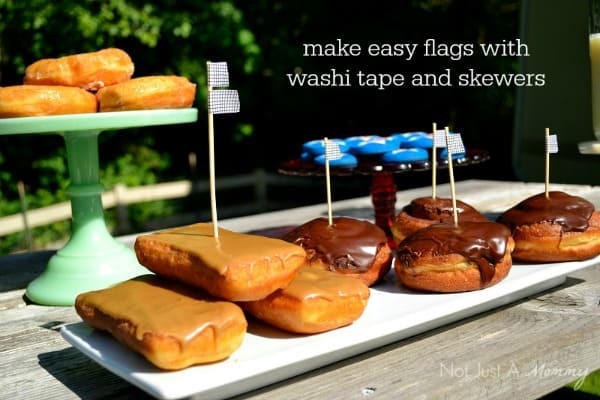 Raise items up a drink dispenser on a cake stand or a stack of books. 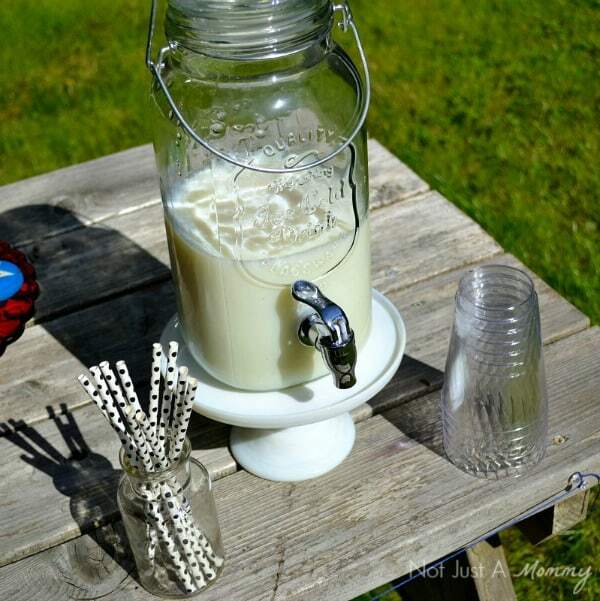 And speaking of drink dispenser, who says it’s just for water and juice? I filled mine with milk for a fun twist. My favorite party trick is lining flat surfaces with coordinating paper. I’m not a big fan of themed servingware…your beautiful poinsetta tray is perfect for Christmas, but then you can’t use it for 11 more months! With paper, you can fit every occasion. 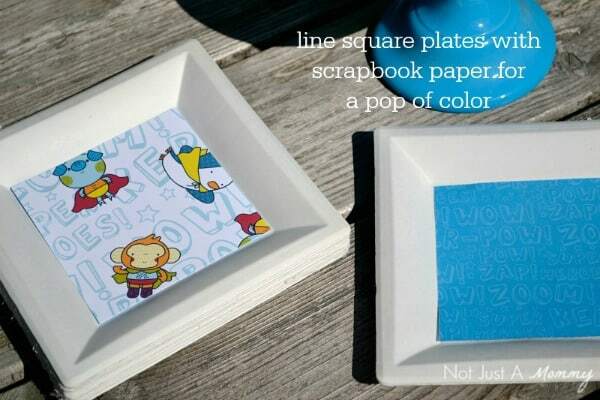 A 4″ square of paper lines Chinet square dessert plates perfectly. I hope you are inspired to celebrate the Super Dad in your life. If you need more superhero inspiration, check out my Super Dad luncheon. Don’t forget to check out my Father’s Day TV segment for our local Q13 Fox sharing great craft ideas. 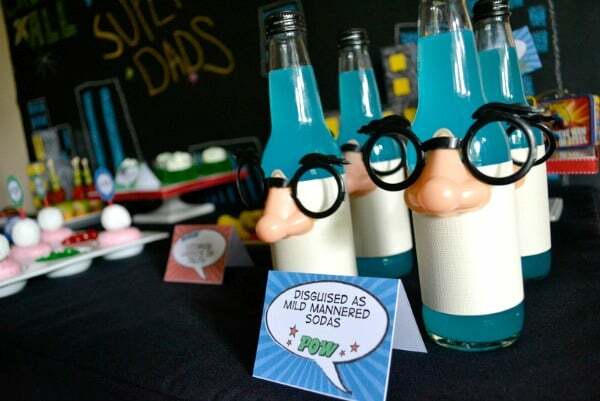 We’d like to send a big THANK YOU to Dawn of Not Just A Mommy for sharing this fun party idea with us. 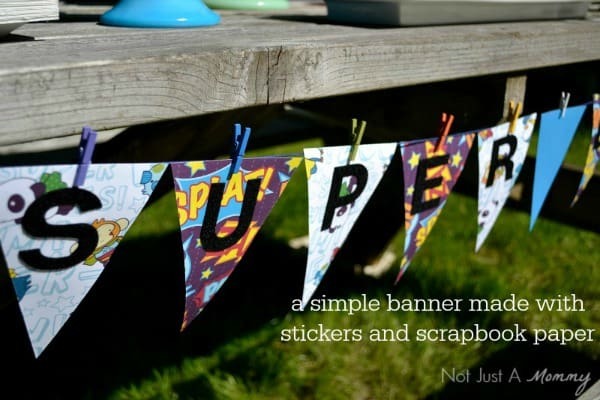 Over on her blog you’ll find loads of inspiration for all types of parties. You can also follow her on Facebook, Pinterest and Twitter for even more creative ideas. Super cute ideas! I don’t have the patience to do all of the decorating, but I think doughnuts are a great idea! I also enjoyed reading your Father’s Day luncheon. We may have to do the hero sandwiches after church on Sunday. Thanks for sharing your ideas!